According to remodelers who answered special questions on NAHB’s Remodeling Market Index (RMI) survey for the 1st quarter of 2014, a simple “desire for better/newer amenities” ranked as the number one reason customers choose to remodel their homes. On a scale of 1 to 5 (where 1 indicates never or almost never, and 5 is very often), the average remodeler’s response was 4.3. “Desire for better/newer amenities” edged out the second place “need to repair/replace old components” by one tenth of a point. These traditional market drivers were the only reasons to remodel with an average rating above 4.0. Another fairly traditional reason, “desire/need for more space” came in third at 3.7. 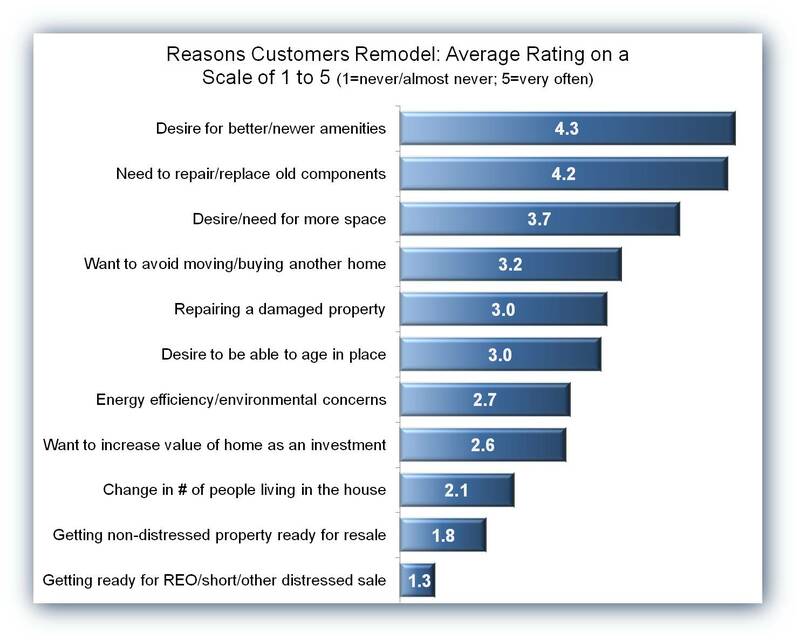 Reasons to remodel that are of special interest to particular stakeholders—like aging in place and energy efficiency—were further down the list, with average responses near the 3.0 center of the scale. Relatively low average ratings for increasing the home’s investment value or preparing it for a sale continue to support the idea that owners are more likely to remodel for themselves than for future owners. Getting a property ready for a distressed sale scored a particularly low 1.3 (very near the minimum possible 1.0). At the margin, of course, less common reasons to remodel can still fuel an increase in activity if they are on the rise. However, this is only the second time we’ve asked the “reasons to remodel” question on the RMI survey (the first being in the first quarter of 2012), and most of the answers on average changed very little in the intervening two years. Indeed, the average rating for 9 of the 12 categories changed by one tenth of a point or less. One exception was an increase from 2.8 to 3.0 in the “desire to be able to age in place,” something many observers were probably expecting given the aging population. “Desire/need for more space” also increased two tenths of a point. “Desire for better/newer amenities” posted the largest gain, going from 4.0 to 4.3. A rise in remodeling projects motivated by desire for more space or better amenities is consistent with the general housing market recovery that many experts expect to continue. This is the second item we’ve posted in May in recognition of National Home Remodeling Month. The first was on the most common types of remodeling projects. Although housing starts may have declined slightly in December, they remain at roughly (a seasonally adjusted annual rate of) 1 million units. Not only is this relatively strong compared to the recent history, it means that new homes are feeding into the beginning of the production pipeline faster than they’re leaving at the other end (as completions have fluctuated within a fairly broad but lower band of roughly 700,000 to 830,000). As a result, the number of new homes under construction increased for the 28th consecutive month in December, from a seasonally adjusted 688,000 to 707,000—breaking above the 700,000 barrier for first time since March of 2009. 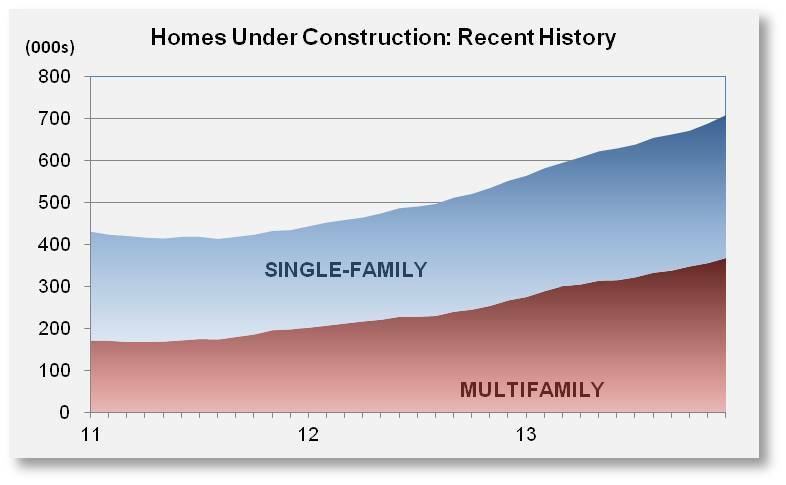 As reported last month, the growth continues to come from both single-family and multifamily construction. In December, the number of single-family homes being built increased for the 23rd time in the 24 months—from 331,000 to 339,000. Meanwhile, the number of apartments under construction increased for the 32nd time in 33 months—from 357,000 to 368,000. One of the reasons the rate of completions is lagging starts and causing the number of homes under construction to swell is that, after a prolonged downturn, it’s difficult to attract factors of production back into the market. Over the past year, shortages have popped up in the markets for certain building materials, developed lots, and skilled labor. A current example is the high share of unfilled job openings in the construction sector reported by the Bureau of Labor Statistics. Standard & Poor’s and Case-Shiller reported that house prices continued to rise in August. According to the release, both the S&P/Case-Shiller House Price Index 20-City Composite and the 10-City Composite rose by 12.8% on a year-over-year not seasonally adjusted basis, the largest increase in house prices since February 2006. House price gains were largest in Las Vegas, 29.2% and San Francisco, 25.4%. Meanwhile, house prices in New York saw the slowest growth, 3.6%, over the previous 12 months. Standard & Poor’s calculates tiered house price indexes for 16 of the 20 MSAs included in the House Price Index – 20 City Composite. Tiered indexes measure changes in the value of existing single-family houses in three price tiers – low, middle, and high. Each tier represents approximately one-third of the sales transactions in each respective market. A previous post illustrated that house prices in the lowest tier tend to be more volatile than house prices in the middle and upper tiers; house prices fell further during the housing bust and have grown faster during the housing recovery. However, this spread between growth rates among house price tiers stands in marked contrast to the historical performance of house prices. It is also a distinguishing factor between cities where house prices have recovered and areas where house prices are still recovering. As Chart 1 illustrates, while house prices across all three tiers declined following the housing bust, house prices in the bottom third of the Phoenix house price distribution fell the most and subsequently rose the most. At the bottom of the housing bust in April 2009, the annual rate of decline in low tier house prices was 58.4%, while the annual rate of decline for house prices in the middle and upper tier was 34.9% and 27.6%, respectively. In April 2010, the annual pace of growth in the low tier was 26.3% while it was only 2.9% and 1.9% in the middle and high tiers. After leading the decline in April 2011, the annual rate of increase in the low tier has exceeded the growth rate in the middle and high tiers. As of August 2013, the spread has narrowed somewhat as the annual rate of increase in the low tier was 30.7% the annual increase in the middle and high tiers was 23.1% and 15.2% respectively. 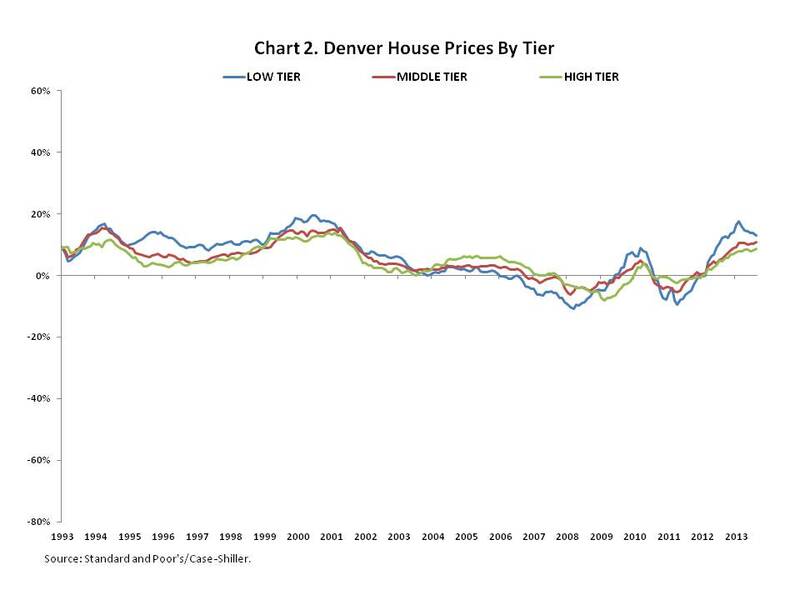 In contrast, house prices across all three tiers in Denver have changed at more similar rates. According to Standard and Poor’s/Case-Shiller, Denver house prices set a new record high in August 2013. 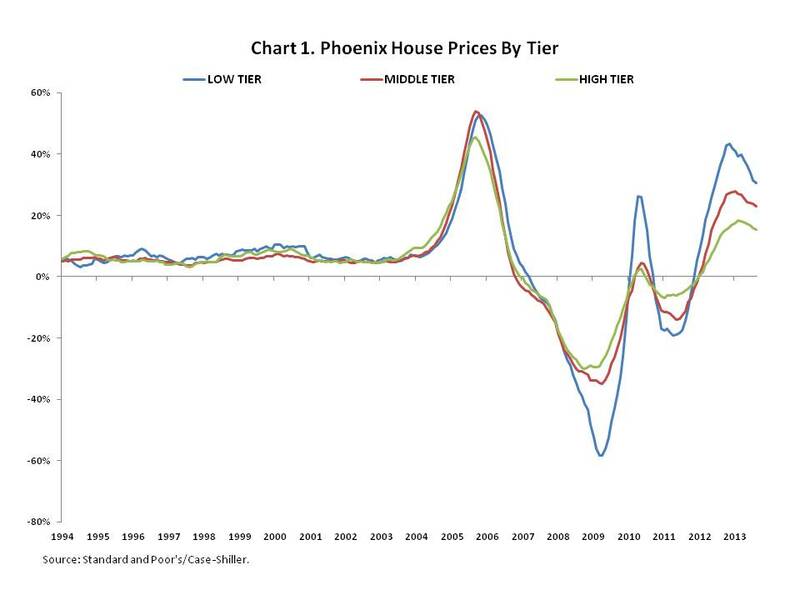 As Chart 2 illustrates, although house prices in the low tier fell more than house prices in the middle and high tiers over the housing bust, the difference in the year-over-year rate of decline was not as wide as the spread in Phoenix. At its depth in March 2008, the annual rate of decline in the low tier was 10.8%, while the annual pace of decline in the middle and high tiers was 5.2% and 3.5% respectively. At their post-boom peak, the annual rate of increase in the low tier reached 17.6% while the annual increase for the middle and high tier was 10.5% and 7.8% respectively. In August 2013, the annual rate of growth in the low tier was 12.9%, while it was 10.9% and 8.7% in the middle and high tiers. Chart 3 shows the spread in the growth rate between the high tier and the low tier for 3 cities where the house price decline and recent house price growth have been most pronounced, and for Denver, where house prices recently set a record high. According to this chart, the relative parity of house price growth across tiers before the housing boom and the disparity during the bust (widening of the spread) suggests that one indicator of normalization of house prices in a market would be a return to parity in growth rates across the tiers and a narrowing of the high-low spread. 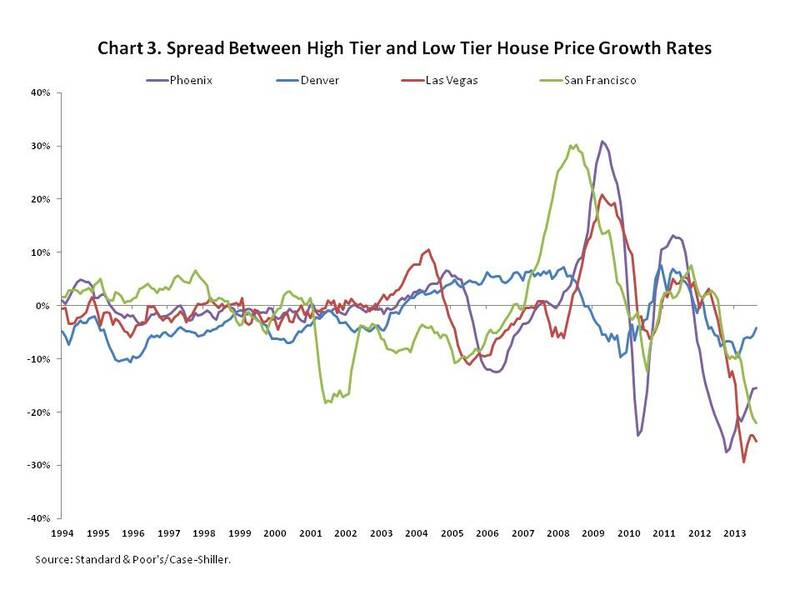 As Chart 3 illustrates, the 2012-2013 inter-tier price movements significantly widened the spread, especially in Phoenix, Las Vegas, and San Francisco, indicating that the high and low tier growth rates were diverging. The recent 2013 narrowing of the spread (except for San Francisco) indicates the high and low tier growth rates are converging. According to the Federal Housing Finance Agency (FHFA), house prices rose in August, albeit at a slower month-over-month pace than in July. In August, house prices climbed by a seasonally adjusted rate of 0.3%, 0.5 percentage points slower than then 0.8% increase that took place in July. Over the past twelve months house prices have risen by 8.5%. Month-to-month growth in U.S. house prices reflected increases in 7 of the 9 Census Divisions. The largest monthly increases took place in the Mountain division (1.3%), which includes Nevada, the West North Central division (1.2%), which includes North Dakota, and the Pacific division (0.8%), which includes California. Gains in these 7 areas of the country were partially offset by declines in the East North Central division (-0.3%), which includes Michigan, and the South Atlantic division (-0.5%), which ranges from Delaware to Florida. Despite a deceleration in house price growth, August marks the 19th consecutive month-over-month increase in house prices. Over this period, January 2012 to August 2013, house prices have risen by 12.7% and have returned to a level last seen in April 2005, surpassing their pre-boom level. 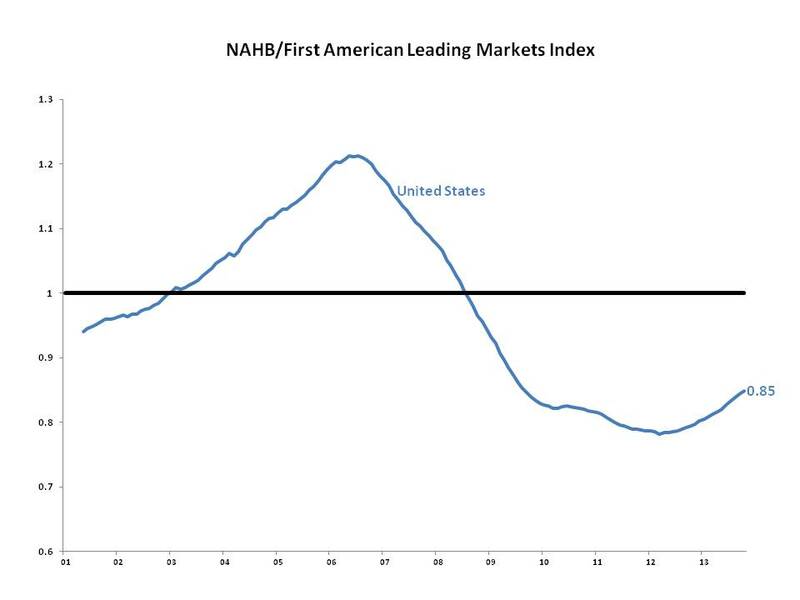 The recovery in house prices is confirmed by the NAHB/First American Leading Markets Index (LMI). This index uses house prices, permits, and employment to track the economic and housing recovery in the US. The index shows that while the U.S. is recovering from the worst of the housing bust and resulting recession, economic activity nationwide has not fully recovered. According to the LMI, the U.S. currently has a score of .85, .15 points from reaching 1.0, a full recovery. With a component score 1.18, house prices have recovered nationwide. However permit activity and employment, with component scores of .43 and .94 respectively, have yet to reach a full recovery. Yesterday, NAHB hosted its Fall Construction Forecast Webinar (CFW) featuring three renowned industry experts. NAHB Chief Economist David Crowe was joined by Mark Zandi, Chief Economist at Moody’s Analytics, and NAHB Senior Economist Robert Denk to present views on the outlook for the US economy and the housing market more specifically. Mark Zandi expressed optimism about the growth of national output (GDP). He expected net growth of about 1.5% in 2013, around 3% in 2014, and about 4% in 2015. His reasons for optimism were based on a fading of fiscal drag on economic growth (i.e. payroll tax increase, sequester, etc. ), improved conditions in the private economy (profitability at private corporations, stability in the banking sector, and household de-leveraging), and an expectation that housing supply will not meet demand. However, he noted that there are significant headwinds which could offset, in whole or in part, the improved situation. These include high level of perceived political uncertainty, a lack of hiring by new businesses, and tight mortgage credit. In addition, the Federal Reserve’s ability to shrink its balance sheet in a manner benign to the economy is not fully certain. David Crowe, Chief Economist at NAHB, noted that economic growth is expected to accelerate over the coming years and recent growth has reflected improvement in the housing market. At the same time, employment is rising. Although mortgage rates have risen in recent months they remain below historic levels. In addition, he noted that both household balance sheets and overall consumer confidence have improved. Consequently, consumers have increased their purchases of durable goods such as cars and furniture, and have indicated a willingness to purchase a new home. The housing recovery is also supported by rising household formations and rising population in prime household formation years. However, the optimism for a continued recovery in housing may be siphoned by tight mortgage credit conditions, high labor costs faced by builders, a shortage of lots, elevated materials costs, and lower appraisals. Robert Denk, Senior Economist at NAHB, was also sanguine about the prospects for a continued recovery in housing, but noted that its pace will be uneven in states around the country. 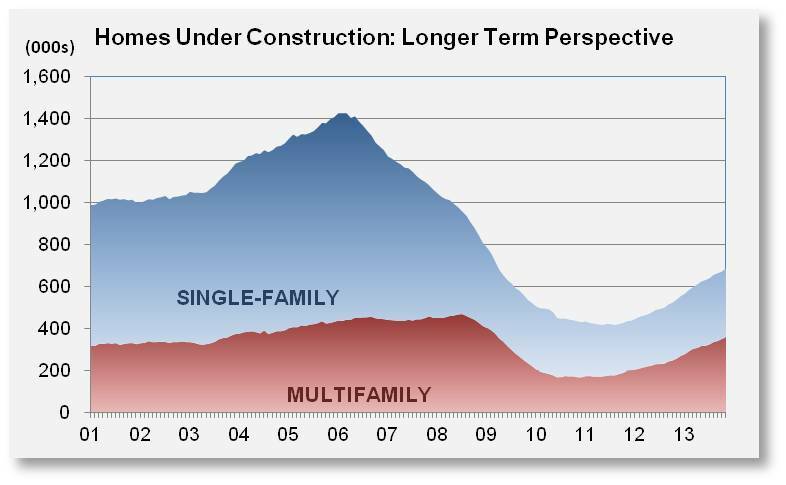 For example, single-family housing starts are expected to reach 93% of “normal” by the end of 2015. However, states that did not depart as far from normal (North Dakota and Wyoming) during the housing bust are further along the path of recovery then states where housing starts virtually collapsed (Nevada and Michigan). In addition, eliminating the foreclosure inventory, a key component of the housing recovery, is more difficult in states that have a judicial process in place to govern foreclosures. Finally, as the recovery continues, the path to normality will begin to reflect the underlying economies of each state and not solely the boom-bust cycle of the housing sector.